It is a well-known, documented medical fact that Vicka Ivankovic has been plagued by suffering for several years. She is said to have had a brain tumor that caused severe headaches, coma state periods, nausea, etc. for years. However, on September 25, 1988, the pain stopped. Vicka wrote about her healing six months before it happened. Her following letter explains. Catholics are divided on the credibility of the alleged visions. Negative judgments, expressed early by the local Bishop, Pavao Zanić, have been voiced by writers such as Michael Davies and E. Michael Jones, who suggested, among many other objections, that the alleged apparitions may have been used by the local Franciscan Order to challenge the authority of the diocese. 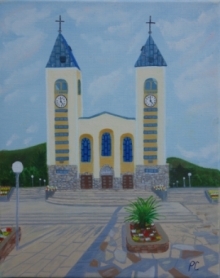 The region in which Medjugorje lies is reported to have seen centuries of rivalry between members of the Franciscan Order, which runs the parish, and the diocesan hierarchy, in particular the Bishop of Mostar-Duvno, the diocese to which Medjugorje belongs. Davies and Jones suggest this conflict played a part in initial, and continuing, opinions within Catholicism.